Skunk 2 built these systems purely for power, so if you want a quiet exhaust, the MegaPowerR exhaust is not for you. 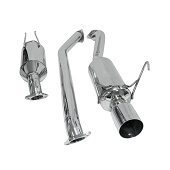 Each system is designed with oversized tubing and mufflers to achieve the additional flow that is required for high horsepower vehicles. Skunk2 Mega Power R exhaust systems are based off of the exhaust systems we custom build for our road race and time attack cars. GReddy Racing Ti-C Exhausts combine the design, looks and flow of the GReddy Full Racing Titanium systems with the durability, deep sound and value. 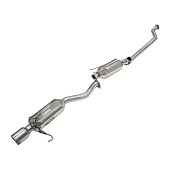 This exhaust system will improve high and mid-range performance. This exhaustÂ is made completely in Japan.